Goodreads is an online networking site for people with a common and strong taste for books and novels. It provides an ocean of information about different books, reviews ratings from users and recommendations from Goodreads for every user depending on his/her reading taste. For that reason, after you install the application and you will be asked to rate 20 books which will be sufficient for them to understand your taste and recommend you books accordingly. Various sections of the android application of the site are discussed below. First, comes the Search tab where you can search books by name of Author, Title and ISBN code. Updates is just like the newsfeed of Facebook in functionality, that is posting updates of your Facebook or Twitter friends but is limited to only updates regarding books. You will get update whenever a friend has updated his/her reading status, which is which books have they read or about to read or proceeded while reading. You can also update your status, your reading progress. A. Read – List of books which you have already completed reading. B. Currently reading- Books you are currently reading. You can update your reading progress and the sections get updated automatically. C. To-read- List of books that you want to read in the future and the names are stored so that you don’t forget them. D. Add a new shelf- A new shelf can be created where you can make your own personal list. 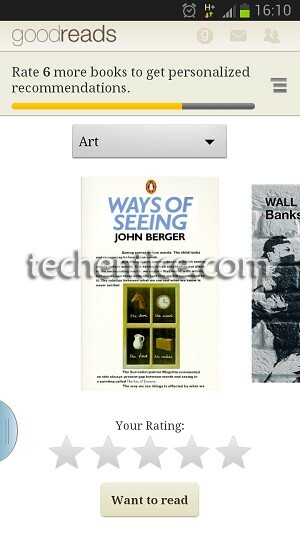 A. Bookshelves- Your books which are listed in the My Book section. B. Recent Updates- This section provides information on your recent activity which includes reviews you have written for any book, ratings you gave and others. Create groups- Your personal group of friends with whom you are more likely to share thoughts. Your friend list is synchronized with Facebook and Twitter friends. Barcode scan is an interesting facility in goodreads where you can search your own books by scanning the ISBN barcode of your books. A. Scan Book- Starts scanning of the ISBN code. B. Start Scanning- This is also scanning of books. C. Scan History- You can view the history of books you have scanned. D. Clear scan history- Clear history of scanned books. E. Preferences- Scanning is notified by Beep on scan. This can be turned on and off. The overall features of the application are quite appreciable. Some more personalizing features and books on different regional languages will be welcomed.